You are here: Home / All Posts / 5 Things that we found (really) tough when we started Eating Clean with Kids. 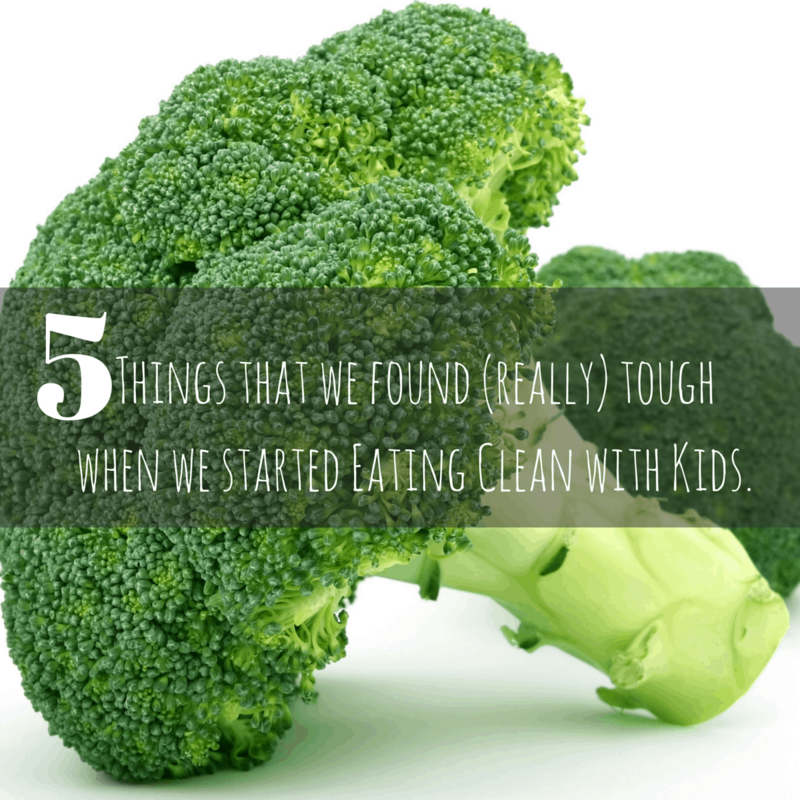 5 Things that we found (really) tough when we started Eating Clean with Kids. March 4, 2015 This post may contain affiliate links. These are the 5 things we struggled with (and still haven’t totally mastered) when our family began clean eating. 1. Comparing ourselves to other families. There will always be someone doing something better than you. Just dont let it stop you doing what you want to do. Picture perfect families eating organic home grown vegetables, alfalfa sprouts and agave nectar treats. Oh yes, those families are out there. But that was (and is) NOT our family. To make this work, clean eating needed to fit into our life, not become our life – or I knew we wouldn’t be able to sustain it. We didn’t start out eating clean. We live in Suburbia. My kids go to school. They’ve tasted chocolate and potato chips. This cannot be undone. Before we overhauled our diet, they were raised with freely available processed foods and knew the ins and outs of the McDonald’s kids meal options. Even now, the only things I can grow in my garden are parsley, weeds and about 8 cherry tomatoes a year. And, to top it, I am not an overly enthusiastic chef. In our defence, we do keep two gorgeous backyard Hens who supply us with free range eggs. However, even though we eat chicken, Ms. Clarice and Ms. Pepper will never end up in our oven. The internet is an informative blessing and a curse. It is human nature to compare ourselves to those around us. Before overhauling our diet, I knew that my family wasn’t eating right, but I didn’t do anything about it because it seemed too hard to start and too much to give up. I had an idea in my head about the Perfect Clean Eating Family, and I almost didn’t bother getting started. Almost. We started small and quietly and made our own set of rules that works for our family. Clean eating fits into our lifestyle now. We are still not that picture perfect clean eating family, but every day we get a bit better. Two of my children didn’t eat their vegetables. No Parent likes to admit this. It was a deep dark family secret. I would put that broccoli on their plate and then conveniently look away as they scraped it into the trash (when they thought I wasn’t looking). I would only feed my kids vegetables that I knew they liked – which was all of two varieties: peas and corn. All other vegetables had to be disguised or discarded. I would break into a sweat when we had to go out to dinner at friends- I knew that at least two of my kids would say “I don’t like this”or “I don’t eat that”, and I would have to cover up with some excuse, “Oh, they had a large lunch” or, “they don’t have a big appetite”. HA! That same child would munch down two sandwiches as soon as we got home. It came down to one thing. I wasn’t doing my job. Part of being a Mom is teaching your children to eat right – for their health as well as their children’s health. Teaching my kids to eat their vegetables has been interesting. Like most things worthwhile, it started off as a momentous endeavour, but now it’s more like a little hiccup at dinner time. We still have our issues and little drama’s but I get more wins, and they eat the vegetables I put on their plate. Now, it’s all very well restricting access to sugary juices in the home – that’s easy, but watch what happens when your kids go to their first birthday party. They head straight for the soda (again, when they think you aren’t looking). The good news is this – fast forward 6 months and all of my children drink more water naturally. They have learned to recognise that their body wants water when it’s thirsty. Yes, they will gladly have a soda at a friends party, but I have also see them refill their cup with water from the tap at that same party rather than reaching for another soda. There is no easy way around this – I had to get more organised. I am not a naturally organised person. I want to be, but I have to work really hard to get this right. I am that person that Pins 1,000 Pinterest pins about organisation around the home, but I have yet to implement even one idea in my own home. Eating clean requires planning otherwise there would never be anything to eat in our home – and we would resort to eating crap again. A couple of things that I stick to – I now shop weekly, I plan my meals for the week AND ALWAYS have at least two easy meals available that I know I can get on the table fast. Shopping can get habitual. I am pretty sure that I could have done it blindfolded and in my sleep. I bought the same stuff week in and week out and I even let my children choose some of the food that went on our plates – think coco pops and fruit loops. Now, I need to think about it. Shopping is part of my job and a skill that I have had to work on. We were eating our way into debt. Next to our mortgage, shopping is the next biggest expense in our home and I was whittling our hard earned money away on crap. Don’t underestimate the importance of learning how to shop wisely – both for health and also economics. Supermarkets popped up on the scene around 100 years ago as a convenient place to go and buy food, and yet it’s unlikely that our grandmothers would recognise most of the products on their shelves as food. I had to relearn how to shop. No more impulse purchases and marketing directed choices. The food you put in your shopping trolley will end up in your children’s growing bodies. Choose wisely. Like most things, you can’t always control what your children will do (or eat) outside of your home, but you can make sure that your home is where they learn the difference between good and bad choices. Clean eating is no different. I hope that by the time my kids leave home, they are able to identify the real food from the crap, shop with conscience and make good choices for themselves and their future families. CLEAN EATING WITH KIDS BOOK OUT NOW. For More Tips and Recipes on how to get your family eating clean, take a look at my Book, Clean Eating with Kids. Available on Amazon. Out now in Print and Kindle.